This product requires the base game THIEF. 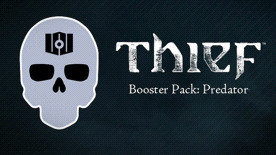 Get access to an exclusive bundle of optional in-game consumables that can empower you and hasten your progression through THIEF. Thief © 2014 Square Enix Ltd. All rights reserved. Developed by Eidos-Montréal. THIEF, the THIEF logo, EIDOS-MONTRÉAL and the EIDOS logo are trademarks of Square Enix Ltd. SQUARE ENIX and the SQUARE ENIX logo are trademarks or registered trademarks of Square Enix Holdings Co., Ltd. All other trademarks are the property of their respective owners. THIEF is required to play this DLC.